Gold/Oil Ratio: Is It Really Making Record Highs? 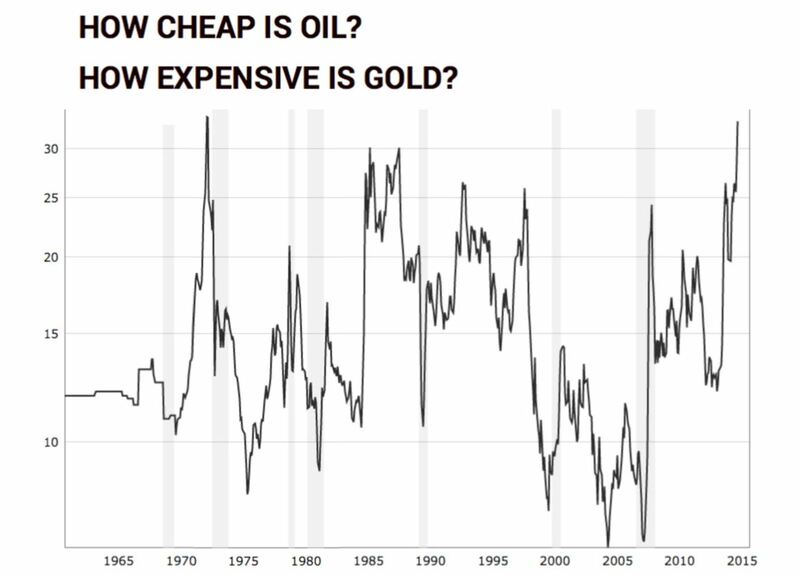 Mining ran a chart of the gold/oil ratio pointing out that conventional wisdom has placed the two together on the theory that rising oil prices push up inflation increasing demand for gold as a hedge. You have stated gold is not a hedge against inflation and you appear to be correct with all the QE from US, ECB, and Japan, yet nothing has happened. Mining says that the average ratio of gold to oil is around 15 reporting it is at record highs now which have not been seen since 1973. The same thing happened in 1980 when a record gold price in inflation adjusted terms again coincided with a sharp rise in the price of oil. The ratio hit 36 during the 1973 OPEC crisis. So has gold or oil bottomed? Or have we entered a new era altogether? I know you will have an interesting assessment of this ratio. That’s what you are known for. ANSWER: Nice chart. However, it is always a question of DATA! If you looked only at a chart of the stock market from 2011 until 2015, you would conclude that the market always moves higher. Long-Term Capital Management collapsed with the best of minds (“When Genius Failed”) because the modeling did not go back beyond 1971. 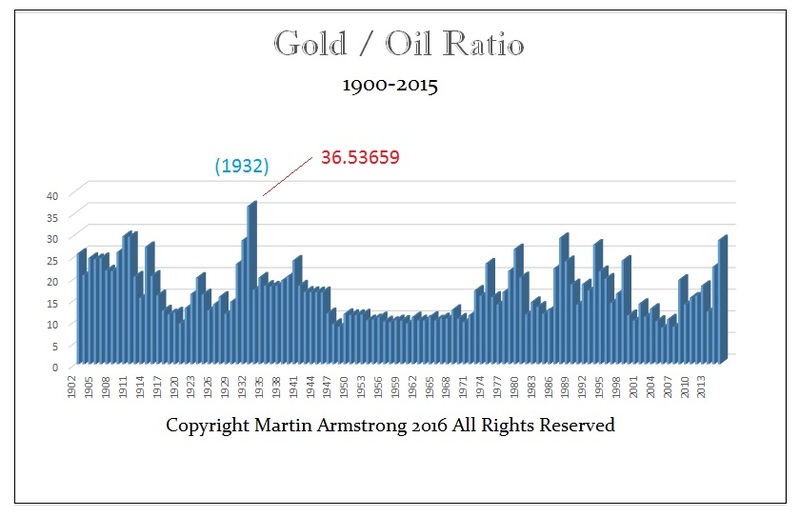 Here is the gold/oil ratio back to 1900. The record high is neither 1980 nor the 1973 OPEC crisis. The record high was 1932 and the Great Depression. This is calculated by simply using annual closings. On that basis, we have not reached the Great Depression high. If oil fell to the reversal at $25, to test the Great Depression high on this ratio, gold would still fall to $875. The average is about 23:1; not 15:1. If gold were really to respond in a financial crisis to a collapse in money stock, then this ratio could hit the 52:1 area. That would be something to write about. We should exceed the 1932 high on this move. We are looking at many mining producing companies and oil producing companies going belly-up in this fish tank. These defaults will hurt banks who lent to them. This is just one slice of the pie we have to finish eating before we can leave the table. DO NOT RUSH INTO MINING STOCKS — IT AIN’T OVER TIL THE FAT LADY SINGS, as they say. « What Happens to Cash When Governments Go Electronic?